So, I’m 36 weeks now. We’re in final countdown / on edge mode. We keep joking about that “I Love Lucy” episode where they rehearse and rehears what everyone will do when Lucy comes out and announces “Ricky, the time has come.” Which of course, doesn’t happen at all like they planned / practiced. 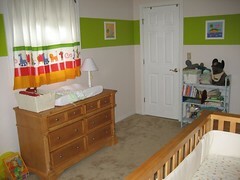 The baby’s room is just about done. I need to order a glider / rocker but the ones I’ve seen online haven’t gotten very good reviews, so I’m kinda putting it off. We’d like to put something up over the crib – I couldn’t find a mobile that I liked… (I have the itty bitty nursery book, and knitted toys I should just make one!) maybe a stencil of the baby’s name? but since we don’t know if it’s a boy or girl that will have to wait. I still really like the idea of wallwords but we’ll see. A few weeks ago my grandmother requested a doorknob cover / cozy. After a little hunting online, I did find a pattern. 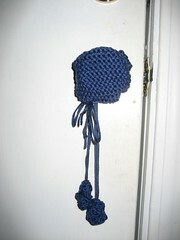 I dug into my stash, found some cotton yarn (in a navy blue color) and got to work. I finally finished it today and then wanted to try it out before sending it along to Gram. Well, all the doors in my house have handles, not knobs! I did find one in the basement leading to our garage. And thankfully, the cover fit. I really think this takes the cake as the strangest thing I have ever knit. I feel like it is so 70s, when everything had a cozy – at least that’s how I think of it. Funny thing is I really want to make both of these mug cozies. I spotted the second one at ravelry and loved it. Not days later, in the latest issue of Blueprint Magazine in a shopping guide section (page 41) they show Snug Mugs from Ruth Cross – $48!!!!!! Ok, it is a “hand thrown porcelain mug….with a handmade Ruth Cross cosy in lambs wool with an ox horn button fastening” Still. 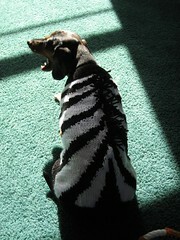 Even though the astronaut costume didn’t work out, I did manage to finish the zebra sweater for Jackson. Apologies to Steven Pastis – author of my current favorite comic, Pearls Before Swine. I especially love the crocodiles – the males speak in this “barely articulate” manner, and greet their zebra neighbors with a great “Hullooo Zeeeba Nay-bah!”. (Hey it’s almost Rhode Island (see the culture entry)) That gets said a lot around this house. So, Jackson’s Halloween Costume for 2008 is dubbed the “Zeeba Sweatah”. 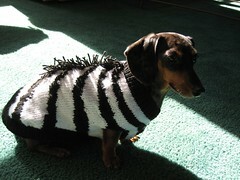 The design came from the “Dashing Dogwear” booklet “Created for Leisure Arts by House of White Birches”. I used Red Heart and Caron Simply Soft. Jackson has a chest measurement of 18.5 inches, so modifications were needed. I worked between the chest sizes 16 inches and 24 inches. I cast on 71 stitches, worked 18 rows before the leg openings, worked to row 30 before casting on the other side of the legs, worked to row 42 and placed markers. Then I followed the chart for the back shaping for the small size. Didn’t add ribbing at the leg openings. I’m quite pleased on the whole. 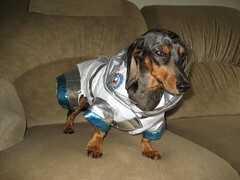 We’re off to the town dog parade and dachshund rescue Halloweenie festival… more later! I put a lot of items on my dog – a lot of them homemade knitted objects. He’s a good sport, though you can tell by his face that he is doing it only because he loves me. Currently I am working on knitting his Halloween costume – it was an ambitious project and I should have focused on it more previously – not just this past week. It should be ok though, so I’m not worried too much. 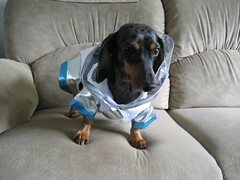 At target today I did find the astronaut costume! I was so excited – a back-up costume, just in case. 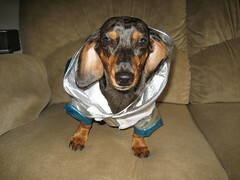 I bought the small size (for dogs with 10in – 13in neck to tail length) – there weren’t any mediums. I cut it off the hang tag board and pop it on the dog. It’s a disaster. There’s no way his back legs can fit into those leg sleeves. Now that I look at the corgi model closer it doesn’t look like his legs are in there either – they are not velcroed shut. 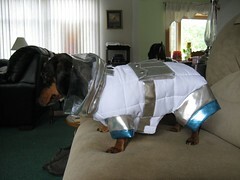 I could live with that, but being a dachshund he’s endowed in the chest area and it barely stays velcroed there. Anyone interested in buying it from me? $9.99. I’ll trade for yarn or books (check out my amazon wishlist even)…. Now the pressure is on and I really need to bust out the original idea! I’m filled with "intrinsic incredible emotion"
Gotta love the Chum! Today’s post was about Meryn Cadell and her song “The Sweater” – I remember being at the mall looking for that song (on cassette!!). My mom tried to be helpful by pointing out a Michael Jackson single, “In the Closet”. Thanks mom, but not helpful. There’s a youtube video – still wonderful! And, since the talk today is about sweaters, I’m 2 rows away from being done with the skirt on the tilted duster. Looking into mods as I don’t know if I want to be concerned with rolling / blocking etc. 2 Rows. So close to being done with that part. Then it’s onto picking up for the collar and getting the sleeves in. The sun is out today (thank goodness) I need Jackson to take advantage of that – gotta get moving on his Halloween costume! This weekend we’re going to a friend’s “Ocktoberfest”. They had a little boy back in May and I never got around to sending them anything that I did knit (tomato hat, mason dixon bib) – I am going to keep those items. 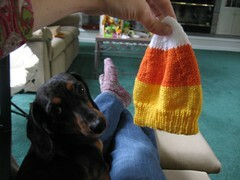 Instead, I took the opportunity to knit up some more seasonal themed items. 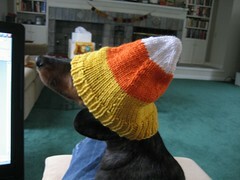 I’m working on a pumpkin hat from “Itty Bitty Hats” and last night I started and finished a Candy Corn Hat from Skeins and Beans. I made the small size (baby) as the little guy is 5 months old. The hat seems really tiny to me, but it’s go stretch. 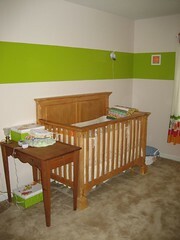 His mom is a nurse who I think works in the NICU, so if it doesn’t fit she can give it to the preemies. 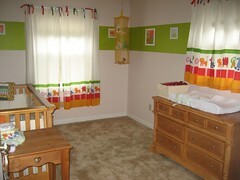 I used Plymouth Dreambaby DK for the yellow and orange and they are fantastic! It’s a nice soft hat too. I would make this again. In all the digging I’ve been doing, I’m composing a rather nasty letter to send off to Connecticare, Blumenthal (the state AG), my former employer, the CT Dept. of Insurance and CT Dept. of Consumer affairs. Apparently dropping a pregnant woman from COBRA insurance due to an employer’s nonpayment of premiums is quite ugly and unfair, but somehow still legal. Yes, we have insurance now, and I should probably stop the whining, but I’m sorry, that’s just not right. There’s something seriously wrong with healthcare in America.